Automotive Lighting, the Magneti Marelli company devoted to the automotive lighting sector, and Changchun Fudi Equipment Technology Development Co. LTD. (FUDI), a Chinese investment company active in the automotive components industry, have signed an agreement to establish a joint venture (JV) company aimed at the production and sale of automotive lighting systems for the automotive market. Magneti Marelli and FUDI are already partners in a JV manufacturing powertrain components since 2012. According to the agreement, Automotive Lighting Reutlingen GmbH will own 60% of the share capital of the new company, Changchun Magneti Marelli Automotive Lighting System Co., Ltd., while FUDI will hold the remaining 40%. The industrial facilities of the JV will be located in the Xin Xing Industrial Park of the Economic and Technological Development Zone of Changchun, Jilin Province and will be aimed at supplying carmakers in the North-East of China. The JV ideally completes the footprint of Automotive Lighting in China, covering the region North of the Yellow river, which is one of the strategic areas for the automotive sector in the country, where both leading Chinese automotive companies and international carmakers operating in China have located their plants. In particular, German premium Original Equipment Manufacturers (OEMs) have a relevant presence in the area. The business scope of the JV will be to produce automotive lighting systems (headlamps and rear lamps) based on halogen, xenon and high-end LED technologies. The plant will be set up within the first quarter of 2016, while the production is expected to start in the first quarter of 2017. Built over a land area of 48,000 square meters, the plant with a total surface of 23,300 square meters will employ a workforce of about 800 employees at his peak volume. Sylvain Dubois, Country Manager of Magneti Marelli China, said: “This new factory in Changchun represents our fourth Lighting plant in the country and marks an important milestone in the expansion of Automotive Lighting in China. This will allow us to support in a better way our strategic customers located in this region”. Magneti Marelli has been active in the Country since 1996 with 11 manufacturing plants and one R&D/Engineering Centres in Shanghai (Magneti Marelli China Headquarters, R&D Automotive Lighting, Powertrain in JV with Shanghai Automobile Gear Works - SAGW -), Foshan (Automotive Lighting), Wuhu (Automotive Lighting and Powertrain), Guangzhou (Electronic Systems), Hangzhou (Shock Absorbers in JV with Wanxiang Qianchao Company), Changsha (exhaust systems with Fiat/GAC), Changchun (Powertrain in JV with FUDI), Hefei (exhaust systems with JAC and Lingdatang) and Xiaogan (Automotive Lighting plant in JV with CSI). With an incidence of over € 2.76 billion in Magneti Marelli’s total turnover of € 6.5 billion, approximately 22 million headlamps and 26 million rear lights produced annually, Automotive Lighting represents one of the main areas of Magneti Marelli’s business footprint as well as one of the leading players at the global level in the lighting sector. Automotive Lighting features a global presence, with twenty six facilities throughout the world, R&D centres focused on innovation in Europe (Germany and Italy) and fifteen application centres operating in thirteen countries in close contact with the customers: Brazil, Czech Republic, China, France, Germany, Italy, Malaysia, Mexico, Poland, Russia, Spain, Turkey and the U.S. Some of Automotive Lighting’s main innovations in the technological evolution of this sector have been the introduction on the market of the first Xenon headlamps in 1991, the Xenon Dynamic Curve Light in 2003, and the first headlamp with active infrared module in 2005. Kicking off a veritable revolution in lighting technology, in 2008 Automotive Lighting launched the full-LED headlamp in mass production (for the Audi R8), with all lighting functions in LED technology. 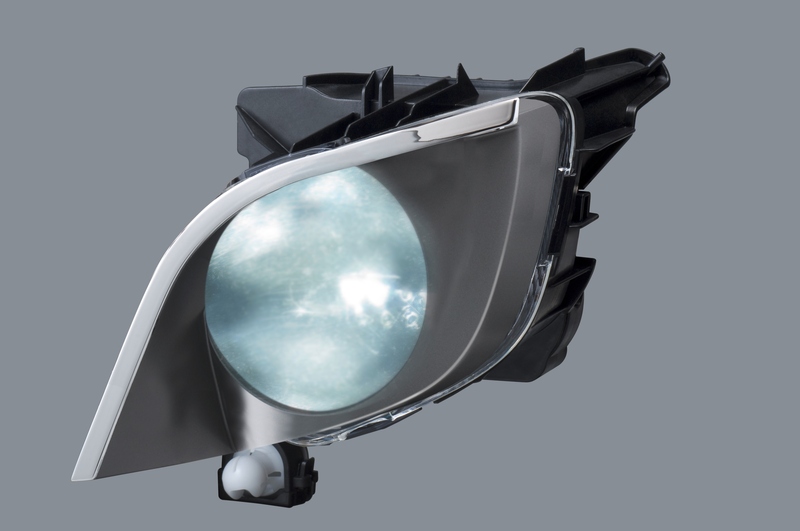 Then came the world’s first headlight to be equipped with an active infrared night vision system and, since 2010, the first full-LED headlamp with adaptive function (for the Mercedes Benz CLS). Last outstanding technological achievement was the first world application of the laser technology to production series cars, with an additional high-beam laser module.